They never thought of this at IKEA. 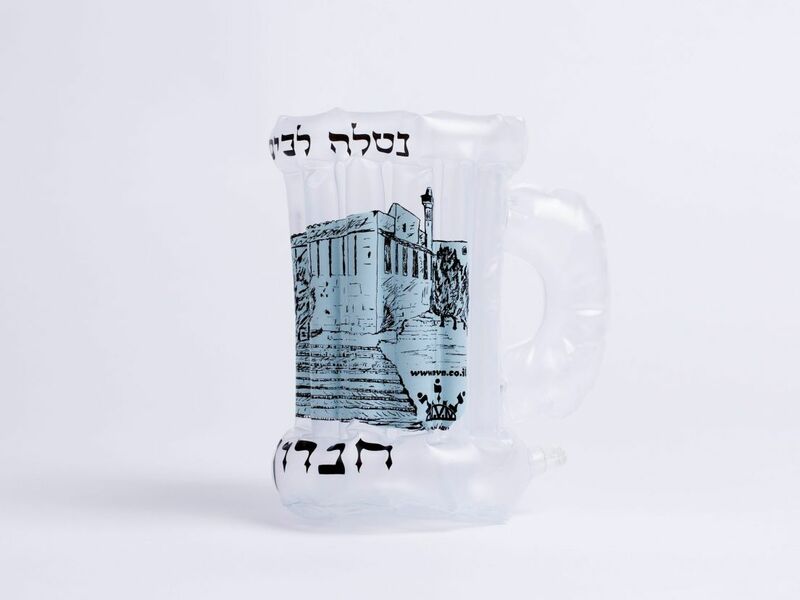 The packaging department at the Swedish design and furniture giant still has something to learn from NVN, a company producing original Jewish items in the West Bank settlement of Kiryat Arba. These include a pocket-size ritual hand-washing cup they invented, which solves the problem of the religiously mandated pre-meal handwashing when roughing it. 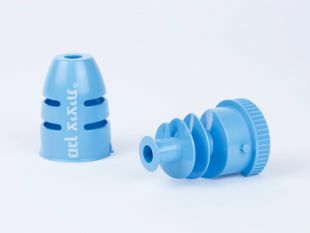 The cup has a PVC handle designed in the shape of a small tower, a base and a water container. Printed on it is a picture of the Cave of the Patriarchs and the word “Hebron.” This is undoubtedly a political hand-washing tool. The cup is inflated before being filled with water; after the hands are washed and the air is let out, it is reduced to a pocket-sized article. Not just that – the hand-washing cup is valid according to Jewish law, as long as inflation does not occur on the Shabbat. High-end designers flood the market with beautiful and elegant items but it’s doubtful that any of them are quite as practical, efficient, simple and cheap as this pocket hand-washing cup, which doesn’t quite meet accepted esthetic standards. 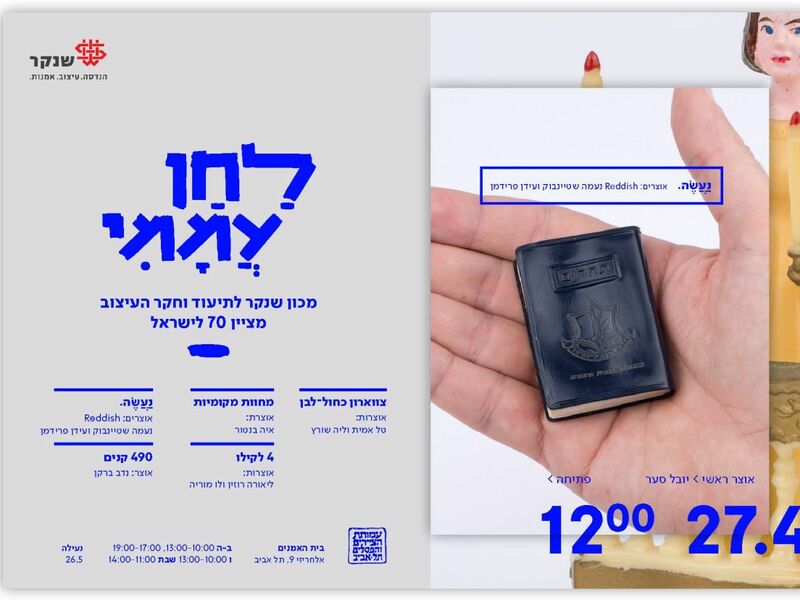 This exhibition is one of five that make up a series of shows called “Popular Melody” at the Shenkar School of Engineering, Design and Art in honor of Israel’s 70th independence day. 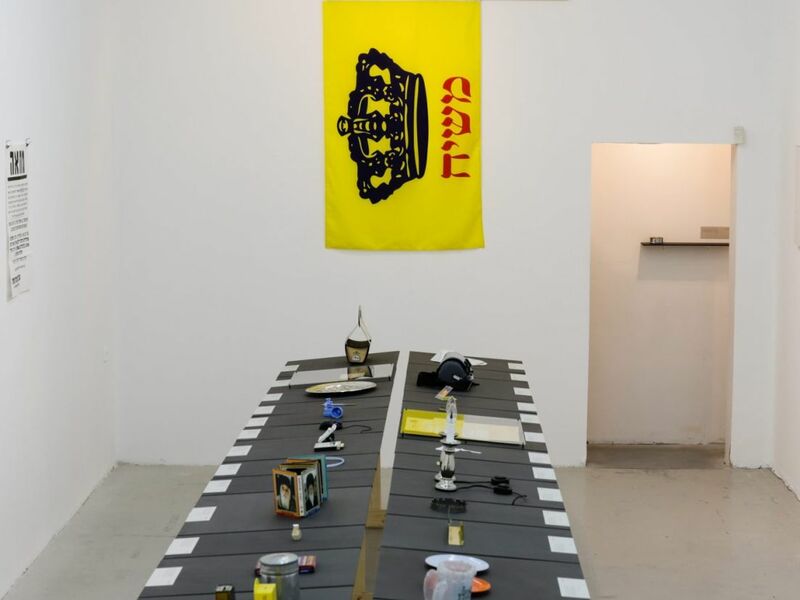 Five female and two male designers were charged with the exhibitions, all of which invoke the question “whether one can speak of specific Israeli design or of design developed in Israel” through different areas of design. What and who is an Israeli is a constant feature in the national discourse. Whatever the answer might be, “Popular Melody” is a surprising and refreshing exhibition that succeeds at having it both ways: avoiding nostalgia while leaving this question unanswered – at least until the next jubilee celebration. “We shall make it” is undoubtedly the most surprising and eye-opening part of the exhibitions. The objects shown definitely fit the rubric of “Popular Melody” or “Design without designers” – a reference to the term “architecture without architects,” coined by architect and historian Bernard Rudofsky. He curated an exhibition under this name in 1964 at the Museum of Modern Art in New York. For the first time it introduced photographed testimony of architecture created by people building on their own for centuries, casting an excited Orientalist view over spontaneous local architecture in contrast to the universalist, modernist and planned Western style. קנים- אחת מתוך חמש התצוגות ב״לחן עממי״ בבית האמנים - אחרי 70 שנה, ללא מילים, וואו! A secular eye will almost unwillingly view the holy artifacts in this exhibition in the same manner. One can hope that in contrast to the ultra-Orthodox public, horrified at the displays of evolution at a science museum, visitors to the Artists House will courageously confront items such as a “kapparot cradle,” an apparatus that prevents chickens used in an atonement ritual before Yom Kippur from anxiously and intimidatingly flapping their wings; a “tzitzit shield” to protect the ritual tassels worn by Orthodox Jews in a washing machine; a “Shabbat mouse” for tech needs that can’t be delayed; and “testimonial strips,” white pieces of cloth that allow women to check whether their menstrual flow has stopped as part of their purification ritual. Another item is bags for body parts that maintain the dignity of terror victims. Other exhibitions that are part of “Popular Melody” include “Local Gestures,” curated by Aya Mentor. It documents the choreography associated with the giving of jewelry and the choreography of wearing it. “Blue and White Collar,” an exhibit curated by Leah Schwartz and Tal Amit, who heads the Fashion and Textile Archives at Shenkar, raises another issue: What makes us identify a fashion item as Israeli? Pieces shown as part of this show involve a new interpretation of traditional Israeli fashions such as those produced by old-time brands ATA and Maskit, or military uniform items. 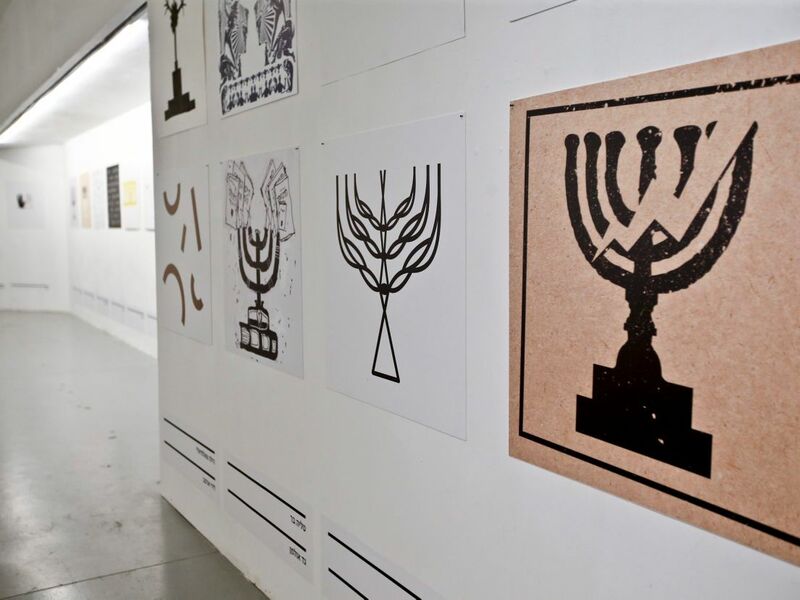 The show “490 Candelabrum Branches” is curated by Nadav Barkan and displays 70 new interpretations of the seven-branched menorah, political and caricature-like, created by 70 graphic designers. Along with these is a fascinating selection from the hundreds submitted as part of an open competition for the design of the official state menorah in 1949. 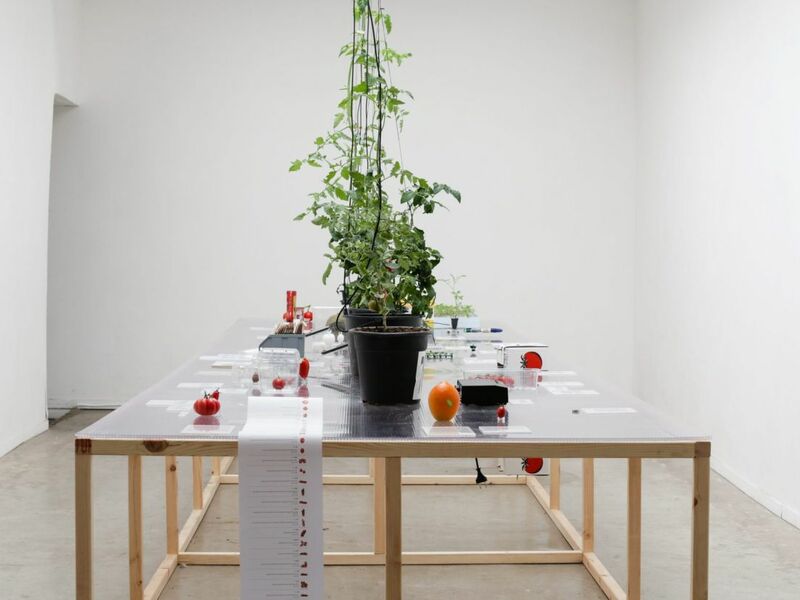 With my rural origins, the title of the exhibit “4 per kilo: Tomato stories,” curated by Liora Rosin and Lou Moria, could not fail to capture my interest. I still remember the Marmande tomatoes that grew by the tap behind our house, which were the sweetest and tastiest in the world. “4 per kilo” follows the route taken by the Marmande tomato of my childhood to today’s cherry tomato. The cherry tomato is more of a model than a brand, more of a start-up than agriculture and manual labor. It displaced the orange from its perch as the Israeli-Zionist symbol (which itself displaced the orange as a Palestinian symbol). 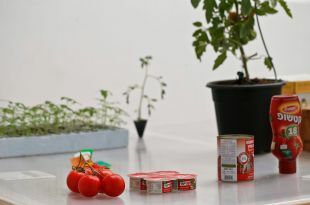 The development of the cherry tomato, which apparently is not an Israeli invention as we’ve been led to believe, parallels developments in the design world. 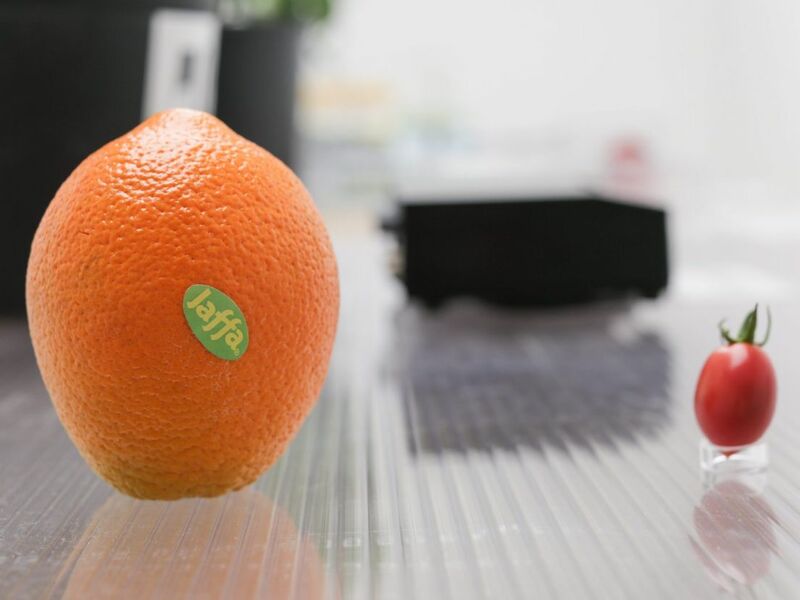 All its characteristics, including its color and taste, the thickness of its skin and its shape, were engineered in a lab, just like designed objects. Design is generally a controversial area, often accompanied by inverted commas, associated with preening, consumerism, luxury and the noveau riche lifestyle. French film director Jacques Tati ridiculed ad absurdum the concept of “design” in his 1958 movie “Mon Oncle,” which mocked the bourgeoisie who make money and surround themselves with senseless design artifacts. In the 1980s, when I worked for the local Jerusalem newspaper Ha-Ir, I welcomed a new young and promising wave of creative designers of furniture and other household items. This wave burst onto the local and international design arena – until it turned out that these bold items could not fit into the average apartment and that their price required taking out a mortgage. The aura around Bauhaus artifacts was greatly dimmed when it turned out that despite their beauty, many of them were impractical, belonging in museums rather than living rooms. “Popular Melody” is not a classic design exhibition. 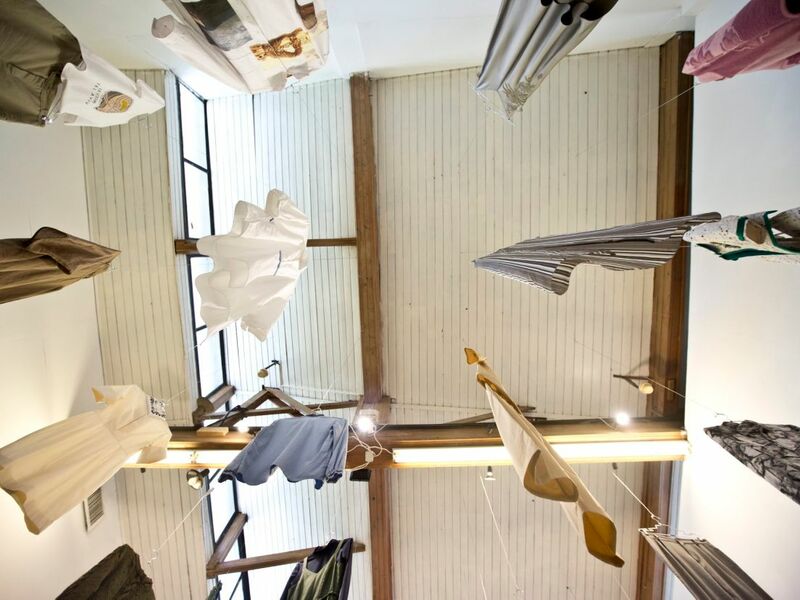 It demonstrates ironic criticism, such as in “Blue and White Collar,” which unravels military uniforms, turning the threads into peace-seeking civilian dress. There is also a political context, such as in “4 per kilo,” which reminds viewers of army operations meant to destroy crops in the Gaza Strip, or the attempt to address people’s heads, not their pockets. Design is not what you thought it was.